Lt. Col. George Armstrong Custer led troops during an 1868 dawn surprise attack on the village of Cheyenne Peace Chief Black Kettle on the banks of the Washita River in what is now western Oklahoma. The historic massacre is interpreted at the Washita Battlefield National Historic Site in Cheyenne. Photo courtesy of the Oklahoma Historical Society. From the Prehistoric Age to the height of Route 66 fame, Oklahoma’s historical museums, attractions and sites are a treasure trove of memorable events, infamous people and enchanting tales. On the patchwork quilt of American history, Oklahoma represents unique stories of well-known Native American warriors, outlaws and lawmen as well as the enduring frontier spirit of countless unknown cowboys, pioneers and soldiers. 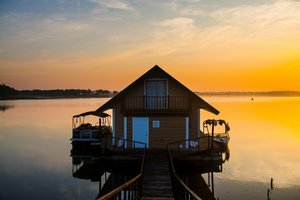 From Civil War battlefields and recreated American Indian villages, to the mansions of Oklahoma’s notorious oil barons and the only city in the continental U.S. to be bombed in WWII, Oklahoma has it all. Awaken the history lover in you, find your favorite era or browse a few in the highlighted list below, and get ready to match legends to places across Oklahoma – no history degree required. No historical tour of the Sooner State would be complete without a visit to the breathtaking Oklahoma History Center in the heart of Oklahoma City. Located directly across the street from the Oklahoma Capitol Complex, this 215,000 square foot, highly-lauded museum complex presents Oklahoma’s history with four permanent galleries, a special exhibit hall, over 200 hands-on exhibits and an extensive genealogy center. Exploring over 50 subjects detailing the history of Oklahoma and its people, including exhibits on the Land Run, Dust Bowl, space exploration, the oil and gas industry and beyond, the Oklahoma History Center is the preeminent destination for those seeking a key to Oklahoma’s historical wealth and an excellent one-stop-shop experience for both the novice and advanced historian. Wherever your historical interests lie, Oklahoma has an attraction or historic site that is guaranteed to fit the bill during your exploration of the state’s rich and varied past. Simply choose an era or interest from the list below to begin your journey through Oklahoma’s most notable time periods. 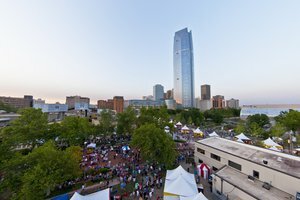 Oklahoma’s Prehistoric Age encompassed roaming dinosaurs, ancient Viking visitors and the headquarters of an ancient paleo-Indian culture that spread across most of what is now considered the United States. Turn back the clock over four billion years and experience prehistoric Oklahoma at the Sam Noble Museum in Norman. Travel through galleries filled with colossal dinosaur skeletons, gigantic bugs and aquatic skeletons excavated from the seas that once covered the Sooner State. The museum contains the world’s largest Apatosaurus and a Guinness World Record-holding, massive Pentaceratops skull. Known as the ancient seat of Mississippian culture and home to Caddoan speaking American Indians between 850 and 1450 A.D., the Spiro Mounds site is famous for the astonishing cultural riches and collection of artifacts excavated from the on-site Craig Burial Mound. Come and explore the archaeological site referred to as the “King Tut of the Arkansas Valley” where you can tour the area of the original mounds, the village area, interpretive exhibits and nature trails. Join the ongoing debate centered around the Heavener Runestone, a stone that reportedly contains Scandinavian etchings from 750 A.D. Although consensus on this claim has never been reached, the runes appear to indicate that Vikings visited Oklahoma and were some of the state’s earliest settlers. Visit Heavener Runestone Park, examine the original stone hidden within a beautiful, rocky valley and decide for yourself. Also see: Dinosaur Tracks in Kenton, the Ames Astrobleme Museum in Ames, the Museum of the Red River in Idabel and the Hoot Owl Ranch in Kenton for more prehistoric finds. Oklahoma stakes claim to some of the richest American Indian history in the nation. Historically known as Indian Territory, the state has been home to 67 Native American tribes. Oklahoma bore witness to stages of removal, conflict, settlement and revitalization. Learn about American Indian life before European contact by taking an invigorating stroll through Diligwa, a 1710 Cherokee Village, located on the grounds of the Cherokee Heritage Center in Tahlequah. Prepare to be moved during an emotional trip through the renowned Trail of Tears exhibit, or head outdoors for lessons in flint knapping, traditional basketry, stickball and other Cherokee games. Trace the history of the Chickasaws at the exquisite Chickasaw Cultural Center in Sulphur and explore traditional village dwellings, ancient artifacts and authentic Chickasaw cuisine. Browse through exhibits detailing the tribe’s removal, allotment and eventual settlement in Oklahoma. Visitors will also enjoy a fascinating 20-minute film in the center’s theater, designed to look like an 18th century council house. A must-stop destination for any American history buff, the Washita Battlefield National Historic Site near Cheyenne marks the location of the 1868 surprise attack on a Southern Cheyenne village. 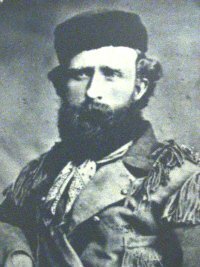 Led by Lt. Col. George A. Custer, the attack resulted in the death of Peace Chief Black Kettle and numerous other members of the Cheyenne tribe. Take a 1.5-mile self-guided tour of the battlefield or contact the site for an historical presentation by a Park Ranger. Also see: Five Civilized Tribes Museum in Muskogee and Sequoyah’s Cabin in Sallisaw for more American Indian treasures. Indian Territory offered a unique page in Civil War history that included tribal division, both Confederate and Union activity, and decisive battles on two official battlefields within Oklahoma state lines. Known as the largest and most important battle waged in Indian Territory during the Civil War, the Battle of Honey Springs was fought by African-American, Caucasian and Indian regiments on both sides. The heroes of the battle have long been considered the 1st Kansas Colored Volunteers, the first black regiment organized under the Union. Steeped in history, visit the Honey Springs Battlefield near Checotah for walking trails with exhibits, arms and equipment, and biographical histories of Honey Springs soldiers. The only antebellum mansion still standing in Oklahoma, the Hunter's Home in Park Hill was built in 1845 by George M. Murrell, a wealthy merchant who later married the niece of Cherokee Chief John Ross. Saved from destruction during the Civil War, the home stands today as a prime example of mid-19th century architecture. The home features original furnishings, an 1896 smokehouse and a log cabin. Once a target for Union troops, the land now occupied by the Atoka Museum, Civil War Cemetery & Visitors Center served as a Confederate outpost during the Civil War. Originally intended to safeguard the stage road into nearby Boggy Depot, this area now features a museum containing Civil War artifacts and a cemetery of Confederate soldiers. Also see: The Cabin Creek Civil War Battle Site in Adair, Fort Washita Historic Site & Museum in Durant, and General Stand Watie’s Grave Site near Grove. Identified as a prime destination for Western history aficionados, Oklahoma has seen everything from cowboys and ranchers, to trail riders and Western showmen. Let Oklahoma take you deep into the lure of the American West. The crowning jewel of Western history museums, the National Cowboy & Western Heritage Museum in Oklahoma City stands as a testament to the appeal, resiliency and glory of the American cowboy. Covering subjects such as the origins of the American rodeo, Western performers and development of the West across numerous, world-class galleries, this museum will transport you back to the cowboy era. Dedicated to the cowboys and trail riders that drove cattle from Kansas to Texas along the infamous Chisholm Trail in Oklahoma, the Chisholm Trail Heritage Center in Duncan gives insight into life along the trail. Experience an interactive film where visitors actually smell bacon as it fries on screen and may get wet as a cowboy falls from his horse during a river crossing. Don’t miss the Garis Gallery of the American West and witness as an animatronic Jesse Chisholm comes to life in the Campfire Theater. Famous for his traveling Wild West shows of the late 19th and early 20th centuries, Gordon W. “Pawnee Bill” Lillie built the Pawnee Bill Ranch in 1910. This 14-room mansion features original furnishings, Western artwork, the ranch’s original blacksmith shop and a drive-through exhibit pasture complete with buffalo, longhorn cattle and draft horses. Make plans to catch a recreation of Pawnee Bill’s Original Wild West Show during the last three Saturdays in June. 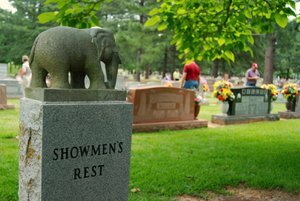 Also see: The Woolaroc Ranch, Museum & Wildlife Preserve in Bartlesville, the Trail Ruts at Monument Hill near Duncan, and Jesse Chisholm’s Grave Site in Geary for more Western adventure. A land of “Boomers” and “Sooners,” Oklahoma has a unique history of settlement stemming from Indian Territory, the great land runs of the late 19th century and beyond into the Homestead Era. For fascinating insight into the settlement and development of Oklahoma, head to the Cherokee Strip Regional Heritage Center in Enid and be rewarded with five exhibit galleries, a complete living history village and the only remaining 1893 Land Office. Step into the life of a Cherokee Strip pioneer and enjoy sifting through thousands of original photographs, oral and video histories and a recreation of a camp scene complete with a covered wagon and other settlement items. The first army post located in Indian Territory, Fort Gibson was in operation from 1824 to 1890. History lovers will delight in the 80-acre property, which contains a total of 29 historic buildings and archaeological ruins peppered throughout the grounds. Built to protect relocated Indian tribes from the encroachment of settlers into Indian Territory, Fort Gibson played a significant role along Oklahoma’s long road to settlement. Living history programs and exhibits round out the fort’s historical offerings. Sod houses, constructed from thickly-rooted prairie grass, were popular on the plains of Oklahoma during the Homestead Era as the vast, surrounding prairie lacked available wood or stone. A testament to the pioneer spirit, an original sod house can still be viewed near Aline. Preserved by the Oklahoma Historical Society and the only one left standing in the state, the Sod House Museum of Oklahoma features early farm artifacts, outbuildings and antique machinery. Also see: The Harn Homestead & 1889ers Museum in Oklahoma City and the Fort Sill National Historic Landmark & Museum in Fort Sill to learn more about Oklahoma’s early settlers. Oklahoma witnessed a boom era in the 1920s as the state tapped into its abundant oil resources. As wealth from “black gold” poured in, a crop of oil barons emerged and staked influential claim over northeast Oklahoma. Located in Bartlesville, “the town that oil built,” the Frank Phillips Historic Home was the primary residence of Frank Phillips, founder of Phillips Petroleum. Today, visitors can step back in time and surround themselves with the 1920s extravagance of the estate. Tour the 26-room mansion and marvel at imported wood walls, original furnishings and marble fixtures. Don’t forget to visit the six-bay garage, home to an on-site museum detailing the intriguing lives of the Phillips family. Lovingly referred to as the “Palace on the Prairie,” the Marland Mansion in Ponca City was designed after a palace in Florence, Italy for E.W. Marland, founder of the Marland Oil Company, now Conoco. Wander through the palatial opulence of the mansion’s 55-rooms and discover Waterford crystal chandeliers, gorgeous tapestries, gold-leaf ceilings and an elevator lined in buffalo skin. Guests will also have an opportunity to learn about the somewhat controversial history of the infamous Marland family. Gain perspective on the history of Oklahoma’s oil industry and the role of Conoco at the Conoco Museum in Ponca City. Visitors to this state-of-the-art museum will learn about the early years of the company, tour a replica of E.W. Marland’s boardroom and hear fascinating stories from Oklahoma’s oil boom era through displays on flat-screen televisions, computer touch screens and more. Also see: The Phillips Petroleum Company Museum in Bartlesville, the Philbrook Museum of Art in Tulsa or take an Art Deco Landmarks Walking Tour in the heart of downtown Tulsa. Home to the longest driveable stretch of Route 66 in the nation, Oklahoma is Mother Road territory. Established in 1926, Route 66 supported many small Oklahoma towns along its path and gave rise to numerous quirky attractions across the state. To experience the far-reaching history of Route 66 in Oklahoma, nothing beats revving your engine and traveling down the historic road itself. Meander through small towns and soak in pure and comforting examples of Americana along over 400 miles of open road. Make sure to seek out the Ribbon Road near Miami, an original section of Route 66 only 9-ft. wide, and pull over at the Blue Whale near Catoosa and Totem Pole Park in Chelsea for unique stops harking back to the road’s heyday. 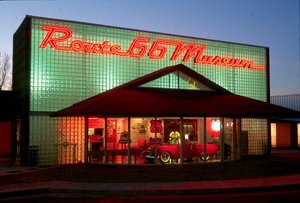 Take a trip through six decades of Route 66 history at the Oklahoma Route 66 Museum in Clinton. Pick up an audio tour and let it guide you through staged exhibit rooms complete with vehicles, transportation history, attractions, artifacts, videos and decade-specific music. Enjoy this tour along the Main Street of America and take a seat in the museum’s drive-in theater for a themed video presentation. Don’t miss the spectacular Route 66 gift shop or “the world’s largest curio cabinet” containing trinkets collected along the route. For a glimpse of earlier, simpler times along Route 66, head to the National Route 66 & Transportation Museum and Elk City Museum Complex in Elk City. Featuring vintage cars, motorcycles and a complex of replica Route 66 businesses out back, this museum highlights everything Mother Road-related from 1920 to 1970. Come to this Route 66 hot spot to view Mother Road artifacts, watch an old movie from the backseat of a vintage car, or jump behind the wheel for a virtual drive down America’s highway. 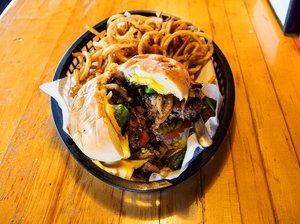 Also see: Lucille’s Service Station in Hydro, the Round Barn in Arcadia and the Beckham County Courthouse in Sayre for even more kicks along Route 66. Oklahoma faced the harsh realities of WWII alongside the rest of the nation. Come learn about WWII’s impact on Oklahoma and the wartime sacrifices of its citizens. Take an eye-opening journey through an actual WWII submarine at the U.S.S. Batfish & War Memorial Park in Muskogee. The U.S.S. Batfish, which now sits directly outside the museum, is known for sinking three enemy submarines and 11 other enemy vessels during WWII. Take a peek inside the submarine’s torpedo room, experience the cramped quarters in the crew cabins and visit the tiny mess hall. Also, don’t miss a variety of military memorabilia on display in the on-site museum. Fort Reno, a fort established in 1874, brought World War II into Oklahoma with its role as a German prisoner of war camp. The on-site chapel was built by German POWs in 1944 and the fort’s cemetery still holds the graves of WWII German prisoners. Historic Fort Reno, located in El Reno, features a number of living history programs throughout the year, including re-enactments of the fort’s role as a prisoner camp during wartime. Also see: The 45th Infantry Division Museum in Oklahoma City which displays military equipment and offers exhibits on the history of the 45th Infantry Division as well as the cabins at Greenleaf State Park, some of which were constructed by German POWs in the 1940s. No matter where your historical interests lie, Oklahoma offers intriguing opportunities to touch the past and expand your understanding.